June 7-9, 2018. The 5th Annual Crothersville Red, White & Blue Festival Fireworks show will begin with a community countdown on June 9th, 2018 at approximately 10PM to close out Indiana’s Most Patriotic Flag Day Festival. 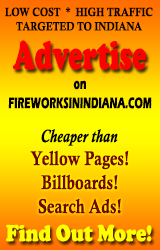 The Fireworks show will be held at Bard Street Park directly behind Crothersville Community School. The fireworks show will be presented by Zambelli Professional Fireworks. The best place for viewing is behind the Elementary (Viewing Area 1) or on East Street behind the park (Viewing Area 2). These areas may fill up quickly so please arrive early. Many other events – check the event site for the full daily schedules.